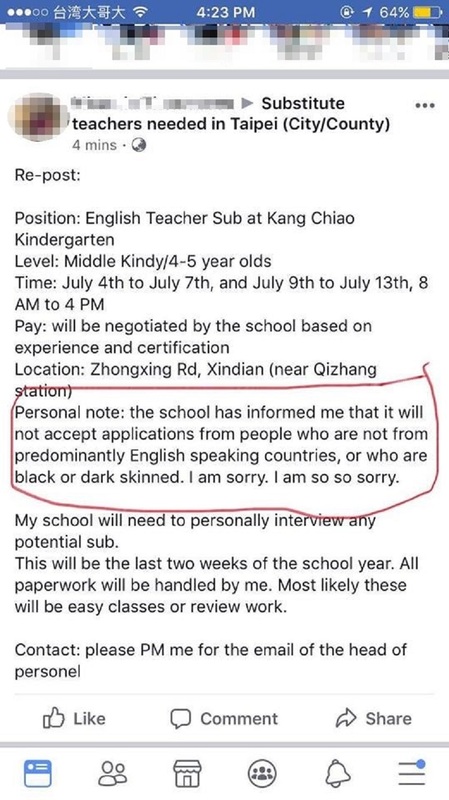 A job ad from a popular private kindergarten in Taiwan is making the rounds on social media for its controversial content indicating that it would not hire “black or dark-skinned” English teachers. Posted on a Facebook page “Substitute Teachers Needed in Taipei (City/County)” on Monday (June 11), the ad for substitute English teachers was created by an employee from Kang Chiao Kindergarten. According to the post, the prestigious private school is looking to hire substitute teachers to teach children between the ages of four to five for eight-hour shifts in Xindian District of New Taipei City. The job is set to start in early July at a rate to be negotiated based on experience and certifications. Taiwan News reports that the job poster also added a section which stated the controversial job requirement which enraged the expat community in Taiwan after it went viral. According to Kaboré, the teacher who posted the ad is as guilty as the school. “If you repeat your boss’s racist statements, you are no different than your boss,” Kaboré noted. Kaboré’s post ignited reactions from other netizens who agree that racism still exists in Taiwan. “We in the black community in Taiwan are really irritated about that and want to show everyone how racist some people in Taiwan are, especially about jobs here in Taiwan,” a 27-year-old Haitian software engineering major at Tamkang University wrote. “I do know that is the norm in Taiwan. We have seen those posts off and on, but this is the most ridiculous we have all seen, which explains this uproar this is literally all over my timeline,” lamented a 28-year-old English teacher from Saint Lucia.